NEW ORLEANS - The population of oceanic whitetip shark, once among the world's most common tropical sharks, has plummeted by 99 percent since the 1950s and the species is nearly extinct in the Gulf of Mexico, scientists reported Wednesday. The study published in the journal Ecology Letters blamed over fishing and called for new restrictions, but federal fisheries officials said the study was flawed and further assessments are needed. Biology professors Julia K. Baum and Ransom A. Myers based their research on a comparison of data compiled by the U.S. government in the 1950s and data collected by trained observers aboard fishing boats in the 1990s. "They're not extinct, but there's virtually none left. This requires a drastic reduction in the amount of fishing," said Myers, a professor at Dalhousie University in Halifax, Nova Scotia. In addition to the oceanic white tip shark, the study also found sharp drops in two other species in the Gulf: the silky shark, down 90 percent since the 1950s, and the mako, down 79 percent. However, federal fisheries officials questioned those findings, saying silky and mako sharks can be found closer to shore than the area studied in Baum and Myers' research. Chris Rogers, a fishery management specialist at the National Marine Fisheries Service, also said comparing data from the 1950s and the 1990s could be misleading, partly because the sharks studied are highly migratory and their populations can fluctuate widely. In May 2003, Myers published a study in the journal Nature reporting a 90 percent decline in large predatory fish in the world's oceans in 50 years. That study also drew skepticism from commercial fishermen. The latest study was funded by the Pew Fellows Program in Marine Conservation at the University of Miami. An advocate for U.S. fishermen disputed the study as a whole, saying its authors failed to recognize that changes in fishing technology over the past 20 years had drastically reduced the amount of sharks accidentally caught by fishermen going for tuna or other fish. "This study is not science. It's pretty random speculation," said Nelson Beiderman, executive director of the Blue Water Fishermen's Association. But Myers said previous studies have shown that changes in fishing technology had little effect on accidental shark catches. 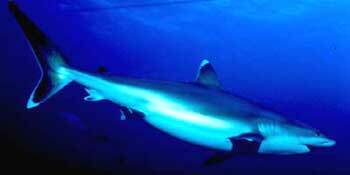 He said fishermen in the 1950s reported that whitetips were everywhere in the open Gulf. Now they are rarely seen, he said. "In descriptions from earlier studies, scientists were astounded at how abundant whitetips were," he said.